Before there were winemakers, there were cowboys. For a century, Santa Barbara County was ranch country. Even now, a fiberglass horse stands in front of Jedlicka’s in Los Olivos, where if you head inside, you can buy Justin Ropers, Stetson Alamos, and beautifully crafted saddles. This Western-ness makes Santa Barbara wine country special. What is terroir, after all, but a sense of place? Still, the county is changing. The number of acres planted in grapevines has more than doubled since 1995, and the number of wineries has risen sharply too. Given the region’s relative proximity to Greater Los Angeles, it’s not surprising that some of these new ventures have been launched by winemakers with show-business credentials. 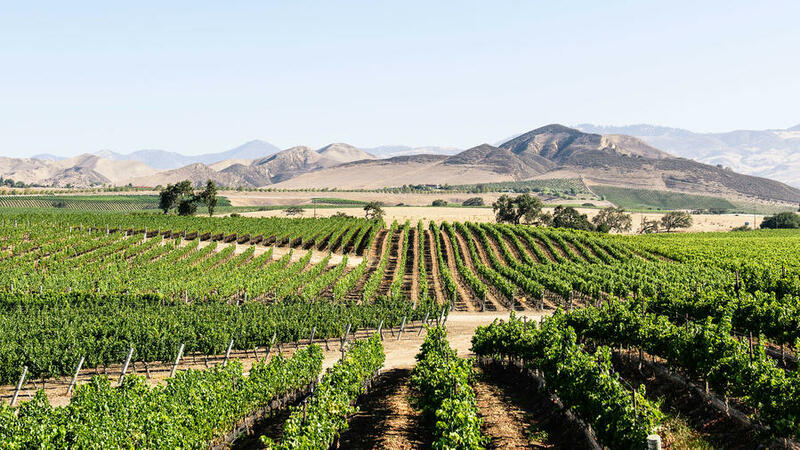 As for the wines, they’re superb and varied, thanks to the county’s topography, which ranges from hot interior valleys in the east (great for Bordeaux varieties) to more westerly, ocean-cooled zones around Lompoc (terrific for Pinot Noir). More than 50 varieties thrive here, in five separate appellations. Santa Barbara Funk Zone. Once the scruffy, industrial neighbor of the city’s Mediterranean downtown, the Funk Zone’s the heart of the Santa Barbara Urban Wine Trail. Here, Southern California wine culture meets surf culture, with board shops near tasting rooms, plus one of the latter (Municipal Winemakers) occupying a former dive shop. One standout: Les Marchands Wine Bar & Merchant, with a meticulously curated selection of Santa Barbara and European wines and housemade charcuterie. Urban Wine Trail: . Municipal Winemakers: $12 tasting; 22 Anacapa St.; . Les Marchands: $$; 131 Anacapa; . We recommend: Municipal Winemakers 2014 “Bright White” Dry Riesling (Santa Barbara County; $24). S.Y. Kitchen. Luca Crestanelli’s modern rustic Italian dishes include 10 specials on some nights. He sources ingredients from local farms as well as more distant purveyors, taking advantage of the Santa Ynez Valley’s bounty and the fact that he can get an exceptional burrata from Italy in 24 hours. His gnocchi is lighter than air; his lamb ragù, astonishing. $$$; 1110 Faraday St.; . ForFriends Inn. The inn’s rooms and cottages vary from Victorian to ranch, and each is named for a local winery or vineyard—for example, Demetria and Refugio Ranch. A three-course breakfast prepared by co-owner Debbie Campbell starts the day, while her husband, Jim, serves the wine at happy-hour gatherings. From $250; . Bacon & Brine. Local foods in a tiny house: How much more of-the-moment can you get? In a minuscule cottage with outside seating, Bacon & Brine serves sandwiches and salads made with local produce and pork from heritage pigs pasture-raised on nearby farms. It’s a team effort: Chef Crystal DeLongpré handles the butchering, smoking, and curing, while wife and “fermentation goddess” Courtney Rae takes care of the sauerkraut and kimchi, among other brined items. $$; 453 Atterdag Rd.; . The Landsby. Cool? Solvang? Aebleskiver and windmills notwithstanding, America’s Little Denmark is becoming pretty darn sophisticated. Exhibit A: The Landsby, formerly the cutesy Petersen Village Inn, now a contemporary Scandinavian boutique hotel. The clean and spare guest rooms feature white-oak floors and handcrafted furnishings. The hotel’s public spaces include a courtyard with fire­pits, plus an inviting lobby bar for cocktails and local wines. From $229; . Rusack Vineyards. In Ballard Canyon, Rusack produces a Zin linked to some of the county’s oldest vines. Its 2013 Ballard Canyon Estate Zinfandel uses grapes grown from cuttings transplanted from an 1884 vineyard on Santa Cruz Island. Is it worth the wait? You bet. $15 tasting; 1819 Ballard Canyon Rd.; . We recommend: Along with the Zin, Rusack 2013 Syrah (Santa Barbara County; $29). Industrial Eats. It looks more like it belongs in downtown Los Angeles than on the Central Coast: a pair of wood-burning ovens in a cavernous space decorated with found objects—a saxophone, surfboard, and old Toledo scale. The butcher paper menu lists “Pizza” and “Not Pizza,” while housemade charcuterie fills the display case. Settle in at one of the communal tables and keep your ears open for vintner gossip: Industrial Eats is a favorite of local wine professionals. $$; 181B Industrial Way; . Alma Rosa Winery & Vineyards. Next door to Industrial Eats is the new tasting venue of Richard Sanford and his wife, Thekla, among the most respected of Santa Barbara County’s early winemakers. Though longtime fans may miss the humble vineyard cottage from Sanford’s early days, the Buellton spot has its own appeal. Built from recycled Douglas fir, it’s light filled and welcoming, and the wines are as good as they get. $12 tasting; 181C Industrial; . We recommend: Alma Rosa 2013 Barrel Select Pinot Noir (Sta. Rita Hills; $60). Lompoc Wine Ghetto. The Ghetto shares its neighborhood with an automotive shop called Hot Rod Alley. But this collection of production facilities and tasting rooms is a must if you want to taste top Santa Barbara County wines such as Flying Goat and Fiddlehead Cellars. At Taste of Sta. Rita Hills, owners Antonio and Jeni Moretti pour the Pinot Noirs that the hills appellation is famous for, drawing from 15 exciting boutique wineries, including Bonaccorsi and Sea Smoke. Lompoc Wine Ghetto: Between 7th and 12th Streets, just N. of State 246; wine ghetto.org. Taste of Sta. Rita Hills: $10 tasting; 1595 E. Chestnut Ave.; . We recommend: Flying Goat 2011 Rancho Santa Rosa Vineyard Pinot Noir (Sta. Rita Hills; $48); Moretti 2014 Camp Four Vineyard Vermentino (Santa Barbara County; $25). Bob’s Well Bread. Tiny Los Alamos is still more tractor than Tesla, even as new food-and-wine destinations locate here, including several with Hollywood ties. Among the latest arrivals: Bob’s Well Bread, an artisanal bakery opened in a renovated gas station by Bob Oswaks, a onetime Sony Pictures Television marketing exec. His wood-fired breads are elegantly crusted, some emblazoned with the bakery’s brandlike logo. $; 550 Bell St.; . 1880 Union Hotel Wine Saloon and Casa Dumetz. More signs of Los Alamos’ show-business sheen: The Wine Saloon at the historic 1880 Union Hotel offers Sta. Rita Hills wines from actor Kurt Russell’s GoGi Wines, plus selections from stepdaughter and actress Kate Hudson’s Hudson Bellamy Wines label. Also worth visiting is Sonja Magdevski’s Casa Dumetz Wines. Wine Saloon: $$; 362 Bell St.; . Casa Dumetz: $10 tasting; 388 Bell St.; . We recommend: GoGi 2012 “Goldie” Chardonnay (Sta. Rita Hills; $50); Hudson Bellamy 2014 “Que Syrah Syrah” Rosé of Syrah (Sta. Rita Hills: $25); Casa Dumetz 2013 “Solid Ground” GSM (Santa Ynez Valley; $35). Foxen Canyon Wine Trail. Starting in Los Olivos, this drive links the Santa Ynez and Santa Maria Valleys, rolling past grazing cattle and hillsides thick with vines. New here is Andrew Murray Vineyards’ oak and concrete tasting room, one of the area’s most beautiful. Twelve miles away, old meets modern at Foxen Vineyard & Winery. A contemporary tasting room hosts Foxen’s Rhône varie­ties; its Bordeaux- and Italian-style wines are available in The Shack, a tin-roofed 1860s blacksmith building. Wine Trail: . Andrew Murray: $15 tasting; 5249 Foxen Canyon Rd.; . Foxen: $10 tasting; 7600 Foxen Canyon; . We recommend: Andrew Murray 2013 Curtis Vineyard Grenache (Santa Ynez Valley; $36); Foxen 2013 Bien Nacido Vineyard, Block 8 Pinot Noir (Santa Maria Valley; $62). Presqu’ile Winery. It’s pronounced press-keel and in Creole means “almost an island,” after the Gulf Coast land the Murphy family owned before Hurricane Katrina propelled them to pull up stakes and start a California winery. The angular hilltop building has views extending to the Pacific, source of the cooling winds Presqu’ile’s Sauv Blanc and Pinot grapes adore. $15 tasting; 5391 Presquile Dr.; . We recommend: Presqu’ile 2013 Pinot Noir (Santa Maria Valley; $42).